Home / Podcasts / Why Weren’t the Bushwhackers WWE Tag Champs? Why Weren’t the Bushwhackers WWE Tag Champs? – If it was a main event, [Vince] never used tag teams. Tag teams were more of attractions. [The Bushwhackers] were attractions. One time he put Ted [DiBiase] and IRS together to work against Hulk [Hogan] and [Brutus Beefcake]. The rest of the time, the tag teams were never sent to the main events. – When you have strong characters, like Jim Duggan, he’s a character, he had the flag, he was over, he didn’t need the belt. To me, when I was doing booking, I put the belts on wrestlers who didn’t have so much of a character, but the belt helped them get to that level. Great workers worked their way up to that level. – I still get stopped and asked about that 1991 Royal Rumble, were I came to the ring, Earthquake grabbed me, threw me out the other side, [I] landed on my feet, and started marching back. People remember that sort of stuff. And when you look at that, look how many years ago that was! – I feel like if I stopped moving around, my body is going to lock up. As long as I can move around on the mat, I’ll keep doing it. I try to keep in shape. – We got a lot of negative publicity. Who are these two goons? 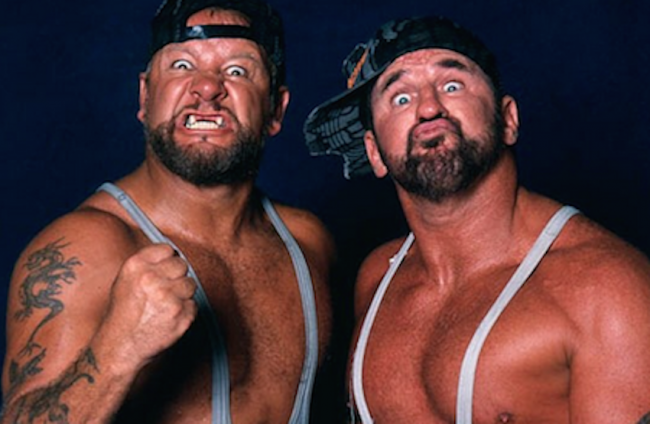 Most of the wrestling fans didn’t know about the Sheepherders or the Kiwis. You know, we first came in 1972 to the USA. Before that, we wrestled all over, [including] far east Japan. We first came to North American in 1972. None of the fans today knew that.